This isn't much news for those who religiously await for any news related to Square Einx's upcoming blockbuster. D23 Japan brought a lot of welcomed news but we are till waiting on the one tidbit that will probably be announced this June at #E32018. "This past weekend at D23 Expo Japan 2018, a special event for Disney fans created by D23: The Official Disney Fan Club, held at Tokyo Disney Resort®, SQUARE ENIX® and Disney thrilled fans with the announcement of a new Disney•Pixar film based world, Monsters, Inc., in KINGDOM HEARTS III. 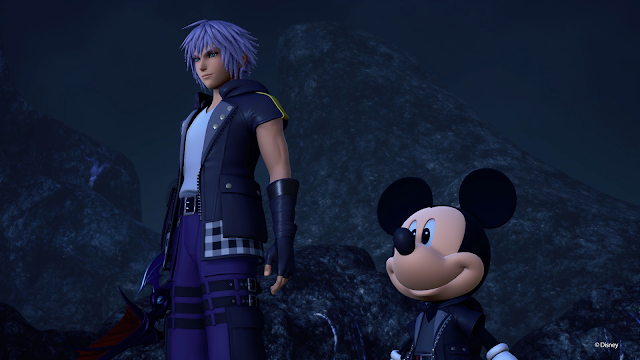 Two new trailers, revealed during the Expo, take viewers deep into the frights and delights of the animated classic as Sora, Donald and Goofy transform into monsters to blend into the Monstropolis cityscape. Is it me or does Riku look like a blue haired Noctis now? I not complaining thought and its understandable being that all of Nomura's characters look alike. Totally hyped for this game. It has been 13 years since Kingdom Hearts 2, and 3 is way overdue. Watch the Monsters INC Trailer HERE!! !